I actually went through three different phases with this album, and two of those were just today. You see, on first listening to some of the songs on Riverman’s Daughter I had a feeling of it being a bit too traditional for my tastes, but I was wrong. Not only did I judge the whole album on the first few seconds of the very first song, which is very different to the modern country music I have been listening to in recent months, but when I listened properly I actually liked that opening track, and there was even better to come. I wouldn’t call The Grahams country, though there are plenty of elements of country. In fact I was struggling to know how to describe Alyssa and Doug, The Grahams, until I visited their website and found they have done that job for me; soulful bluegrass with hints of earthy Americana, adding colors from traditional folk and country blues, into an infectious blend of storytelling that results in songs of love, loss, yearning, and the view from rural American roads less traveled. I wouldn’t have come anywhere close to such an all encompassing and accurate description of their music. It’s a fairly eclectic album, as you’d probably expect from a duo describing themselves as they have, but there is one part of that I must focus on – storytelling. There are so many stories told on this album, it’s like witnessing heartfelt entries from a journal, put to some music that fit the words like a glove. Add in the deliciously haunting singing of Alyssa on songs such as Riverman’s Daughter and Cathedral Pines and you have something really very special. A Good Man is probably the most contemporary of the tracks on this album and showcases some of Alyssa’s more gentle singing, which builds like the song as it progresses. It’s a good job this is one of my favourite tracks as we hear it three times, with the Acoustic and Radio Mix versions added to this deluxe version. There was a certain point in the album at which I wondered what it would be like to hear Alyssa belt out a really big song. We get a little tease of this in A Good Man and even more in Goodbye Babe and Down By The River, but I’d still like to hear a really big powerful vocal, just to satisfy my curiosity. While we’re pandering to my curiosity, I’d like to hear a little bit more from Doug, who we do hear harmonising with Alyssa throughout the album, but never on his own. But that’s understandable, given what a fantastic voice Alyssa has, and with so much range, and I assume the many instruments he plays on the album. Listening to Riverman’s Daughter for the second time today, I was overcome with desire to see The Grahams perform live, as I can only begin to imagine what it must be like to experience these incredible songs in person. How gutted was I when I discovered that they actually came over to the UK last year. Alyssa and Doug, please come back – the drinks are on me! I’d like to see them play in an old establishment with wooden beams, and where the light is provided predominantly by candles. 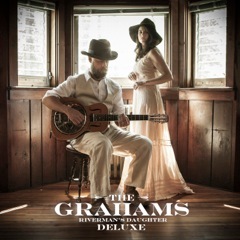 I didn’t know of The Grahams before being introduced to Riverman’s Daughter, and now I’m a fan, and currently listening to the album for the 3rd time today as I write this. It’s become the in thing to re-release albums as deluxe versions, but their cover of Neil Young’s Down By The River is worthy of this alone, not to mention the extra songs and acoustic versions which will always get my vote. This really is a great album, and they even have a vinyl version, which the vinyl collector in me applauds. This deluxe version of Riverman’s Daughter comes out on February 4th and I recommend you check it out. You can read more about The Grahams on their website, Twitter and Facebook. I was sent a copy of Riverman’s Daughter but was under no obligation to review it.